“I was missing the connection I’d felt within that community and was looking for a way to re-establish it – and to gain a deeper philosophical understanding of the world,” she said. 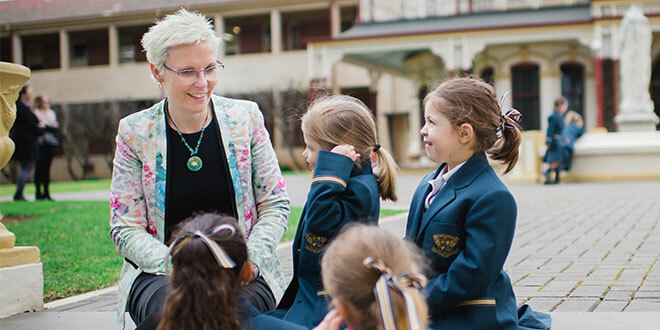 Dr Archard, now the Principal of Loreto College in Adelaide, undertook a Master of Theological Studies online with Australian Catholic University (ACU). “The course at ACU appealed because it covered such a broad range of challenging and thought-provoking topics. It also offered the opportunity of a four-week study tour to religious sites in Israel, Jordan, and Palestine, which was a real drawcard. “That trip was an outstanding, fascinating experience and it had a profound impact on me. It’s made me engage in a more global debate around religion and politics and given me a far better understanding of how different religions interact. Distance learning offers flexibility for students and allows them to continue their education while working. “I had the opportunity to learn from experts all over Australia. The lecturers were hugely supportive, and I felt very much a part of the ACU community,” Dr Archard said. “Studying for my masters at ACU provided the impetus for me to return to Catholic education. It’s has been very important to my role here at Loreto, supporting my ability to lead the school in its mission and values,” Dr Archard said. “I love leading the education of young people – to me, it’s the most important job you can do in the world. Education changes lives, and there’s nothing more rewarding than seeing the face of a child when they overcome a challenge and learn to do something new, or better. The largest Catholic university in the English-speaking world, ACU’s 32,000 students are spread over seven campuses across Australia and one in Rome, providing them with the benefits of a national university combined with small campus learning environments. ACU has a long history of producing quality graduates. Our strong links with partner schools and sector organisations give a practical edge to our courses. Our students graduate ready to start their careers in Catholic and other faith-based schools, government and independent schools, and a wide range of early childhood education settings. To find out more visit www.acu.edu.au. For immediate assistance students can call 1300 ASK ACU (1300 275 228) or email askacu@acu.edu.au.